NBA veteran Kyle O’Quinn is set to have his jersey retired at Norfolk State in February. See when and where here. 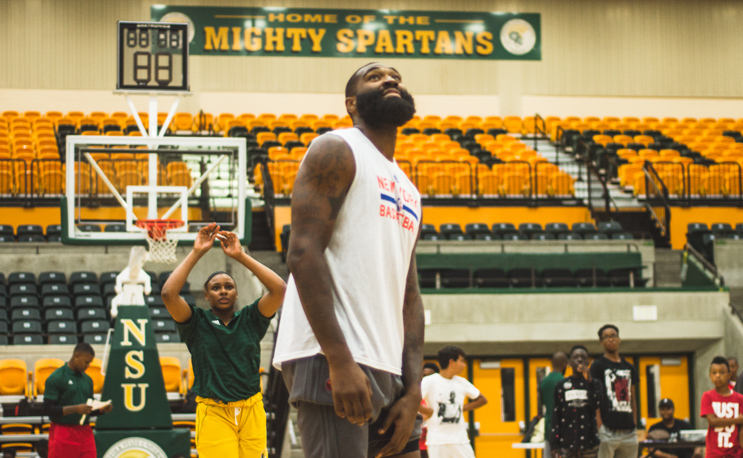 NORFOLK, Va. – Norfolk State University will retire Kyle O’Quinn’s No. 10 Spartan jersey at NSU’s home game against North Carolina Central on Feb. 16, the athletics department announced on Monday. O’Quinn will be the third player in NSU men’s basketball history to have his jersey number retired, joining Bobby Dandridge (No. 12) and David Pope (No. 34). O’Quinn will be honored during halftime of the NSU-NCCU Alumni Day men’s game on Feb. 16, which tips off at approximately 6:30 p.m.
Dandridge, Pope and the five NSU women’s players with their numbers retired were honored last Saturday in a ceremony at the NSU-Maryland Eastern Shore game. After playing a key reserve role as a freshman on NSU’s MEAC Tournament runner-up team in 2009, O’Quinn earned three straight All-MEAC awards. He was a second-team All-MEAC choice as a sophomore in 2010, then was a two-time All-MEAC first-team selection in 2011 and 2012. O’Quinn averaged 11.5 points and 8.8 rebounds as a sophomore before posting back-to-back seasons where he averaged a double-double: 16.4 points and 11.1 rebounds in 2010-11, and 15.9 points and 10.3 rebounds in 2011-12. But O’Quinn will forever be remembered for his magical senior season in 2011-12. That year, he won his second straight MEAC Defensive Player of the Year award, and became the first player in MEAC history to win both the MEAC Player of the Year and Defensive Player of the Year awards in the same season. He capped that off by earning MEAC tournament Most Outstanding Performer honors after leading the Spartans, who went 26-10, to their first-ever MEAC tournament title and NCAA Division I tournament berth. From there, O’Quinn led NSU to what was (at the time) just the fifth-ever upset by a No. 15 seed over a No. 2 seed in NCAA tournament history, as the Spartans knocked off Missouri 86-84 behind O’Quinn’s 26 points and 14 rebounds. Missouri was ranked No. 3 in the national polls entering the tournament and was a Final Four favorite of many prognosticators. To this day, ESPN ranks the upset as the biggest in NCAA tournament history in terms of point spread. O’Quinn rode that performance and new-found fame to several more honors, including the Lou Henson Award for the nation’s top mid-major player – a first for an HBCU player. O’Quinn was picked by the Orlando Magic in the second round of the 2012 NBA Draft. He was the first Spartan drafted since 1988 and first MEAC player drafted since 1998. He played six seasons with both the Magic and then the New York Knicks before signing with the Indiana Pacers for the 2018-19 season. O’Quinn still ranks as the top shot-blocker in NSU history, with 283. He also ranks seventh in program annals in rebounds (1,092), 10th in field-goal percentage (55.3) and 15th in scoring (1,607 points). He is still the only two-time winner of the MEAC Defensive Player of the Year Award. O’Quinn will be inducted into the MEAC Hall of Fame in March. The Bison put the bag on the table for former George Washington coach.